To benefit from this promotion you will need to request a Cyclescheme Certificate between 19 March 2018 and 31 May 2018. Certificates can be redeemed between 19 March and 28 July 2018. Cannondale bikes available are the Bad Boy 3&4, the Quick Disc 2&3, the Quick CX 2&3, the Quick Althea 1&2 and the Trail 4. Trek bikes available are the Marlin 6/Skye SL WSD, Fx 2 Disc/DS/Neko 3 WSD, Domane AL 3/Domane ALR3, Emonda ALR5/Checkpoint ALR4 and Checkpoint ALR 4 WSD. All participants in this scheme accept the following terms and conditions. The scheme is exclusively available at Independent Bicycle Dealer stores that are Cannondale or Trek dealers. A list is available on request. Certificates must be redeemed instore and cannot be redeemed online. They are not transferable. The £50 promotional credit must be used at the point of purchase – it cannot be carried forward. The specific bike make and model that is eligible for the promotion is subject to availability and Cyclescheme and Cannondale and/or Trek reserve the right to offer an alternative. Items that can be purchased with the credit are also subject to availability. There are no cash or other alternatives available in whole or in part. Limitations of liability: Neither Cyclescheme, its agents or anyone professionally connected to the promotion, assume any responsibility or liability for any injury or damage to entrants upon delivery and/or use of the items.Cyclescheme is delivering the Spring campaign on behalf of Cannondale and Trek. At no point will Cyclescheme be financially liable for credit, replacement stock or online vouchers. All queries should be addressed to retail@cyclescheme.co.uk. Your marketing preferences will remain the same. In the event of any dispute, Cyclescheme’s decision is final. Evans Cycles and Cycle Surgery are not running the promotion. To benefit from this promotion you will need to request a Cyclescheme Certificate for £750 or more between 19 March 2018 and 31 May 2018. The scheme is exclusively available online at ribblecycles.co.uk. Certificates must be redeemed online. They are not transferable. The specific products that are eligible for the promotion are subject to availability and Cyclescheme and Ribble reserve the right to vary this. 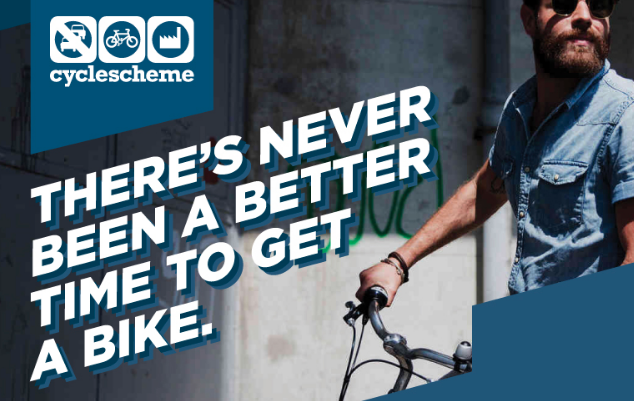 Limitations of liability: Neither Cyclescheme, its agents or anyone professionally connected to the promotion, assume any responsibility or liability for any injury or damage to entrants upon delivery and/or use of the items.Cyclescheme is delivering the Spring campaign on behalf of Ribble. At no point will Cyclescheme be financially liable for credit, replacement stock or online vouchers. For Cyclescheme to fulfil this offer in conjunction with Ribble, we need to supply Ribble with the following personal details - Name and Email address. Your information will only be used for Ribble to deliver the offer to you and will not be used for marketing or promotional purposes. By participating in this promotion you agree to the sharing of your information with Ribble in order to receive the £30 voucher by email from Ribble as part of our spring campaign 2018.